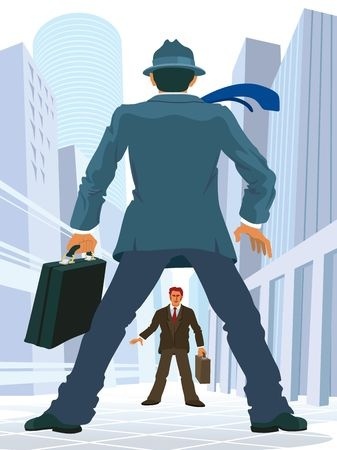 STACKING – the practice of entering into a cash advance transaction or loan knowing that the merchant already has one or more open cash advances or loans with a competitor – is causing a rift among merchant cash advance companies and small business lenders. On one side are companies that only originate first-position deals. These companies generally include a clause in their contracts prohibiting the merchant from obtaining another merchant cash advance or loan until the company receives all of the future receivables it has purchased or is fully repaid. First-position companies view stacking as a threat to recovery of money advanced or loaned to merchants. On the other side are companies that routinely offer second or third-position deals. These companies argue that merchants with adequate cash flow to support additional advances should be free to obtain them. See White Plains Coat & Apron Co. v. Cintas Corp., 8 N.Y.3d 422, 425 (2007). So when is advancing money to a willing merchant “improper” under the law? No reported court decisions have tackled stacking, let alone discuss whether interfering with a prior merchant cash advance or loan contract is improper. In fact, few cases discuss this issue at all. 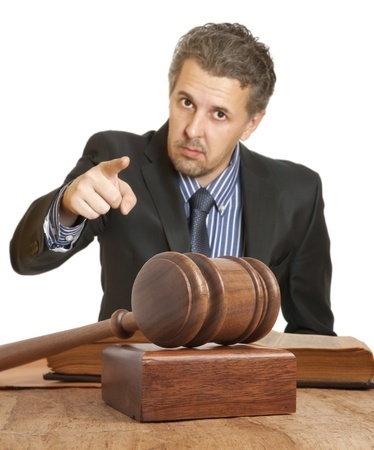 According to Section 767 of the Restatement Second of Torts, the tort of tortious interference does not have hard-set rules. The issue in each case is whether the interference is improper under the circumstances and whether, upon a consideration of the relative significance of the factors involved, the court should permit the conduct without liability, despite its effect of harm to another. In other words, it is a fact-intensive analysis. The New York Court of Appeals put it this way: “At bottom, as a matter of policy, courts are called upon to strike a balance between two valued interests: protection of enforceable contracts, which lends stability and predictability to parties’ dealings, and promotion of free and robust competition in the marketplace.” White Plains Coat & Apron Co. v. Cintas Corp., 8 N.Y.3d 422, 425, 867 N.E.2d 381, 383 (2007). Because there are no reported court cases addressing stacking, we can only look to cases between other types of businesses to see what courts have said about “improper” interference. Maryland’s highest appellate court has held that inducing a breach of contract, even for competitive purposes, is improper. Macklin v. Robert Logan Associates, 334 Md. 287, 303 (1994). In contrast, New York courts have concluded that improper interference is conduct that goes beyond a minimum level of ethical behavior in the marketplace. In the White Plains Coat & Apron case, a New York-based linen rental business sued a competitor in federal court for tortious interference with existing customer contracts. White Plains claimed that it had five-year exclusive service contracts with customers and that, knowing of these arrangements, Cintas induced dozens of White Plains’ customers to breach their contracts and enter into rental agreements with Cintas. White Plains alleged that Cintas trained its sales reps to convince its customers to abandon their contracts with White Plains even after the customers told Cintas that they had contracts with White Plains. White Plains sent Cintas a letter demanding that Cintas stop soliciting and servicing White Plains’ contract customers, enclosing a list of customers allegedly solicited improperly. When Cintas refused to stop pursuing its customers, White Plains sued. In a Florida case, Azar v. Lehigh Corporation, 364 So.2d 860 (Fla. Dist. Ct. App. 1978), a Florida appellate court upheld a restraining order against a former salesman of a developer after he allegedly tortiously interfered with the developer’s contracts. Lehigh Corporation developed and sold real property in a large development project in Lee County, Florida. Part of Lehigh’s promotional campaign brought prospective purchasers to see the development and stay at the only local motel at Lehigh’s expense. Lehigh’s former salesman, Leroy Azar, would follow prospective customers to the motel and persuade them to rescind their contracts for the purchase of property and to purchase property from him at a lower price. Azar spotted customers by following people down the street and observing whether they were carrying big envelopes full of Lehigh sales literature. He then would then seek out the customers in their motel rooms and offer to handle the rescission of his contract if the customer would move out of the motel and buy a lot from him. Azar also equipped his car with a large sign advertising the sale of his lots and followed Lehigh’s tour bus full of prospective customers. The trial court granted the restraining order against Azar. Azar appealed, arguing that customers had a legal right under federal law to rescind their contracts within three days and that he was merely providing them with an opportunity to be relieved of their contract and to obtain comparable property for lower prices. Though trade warfare may be waged to the bitter end, there are certain rules of combat which must be observed. . . . W. Prosser, Law of Torts (4th ed. 1971) at 956. The appellate court explained that the issue is whether the subject conduct is considered to be “unfair” according to contemporary business standards. How courts will treat stacking among competing merchant cash advance companies and lenders remains to be seen. The analysis of what is “improper” interference versus vigorous, but acceptable, competition will be based on the specific facts of each case. In the meantime, merchant cash advance companies and lenders that engage in stacking should consider applicable state law, including case law, and whether their conduct could be considered improper under the circumstances. Robert Cook, Cathy Brennan and Kate Fisher are partners in the Maryland office of Hudson Cook, LLP. Robert can be reached at 410-865-5401 or by email at rcook@hudco.com. Cathy can be reached at 410-865-5405 or by email at cbrennan@hudco.com. Kate can be reached at 410-782-2356 or by email at kfisher@hudco.com. 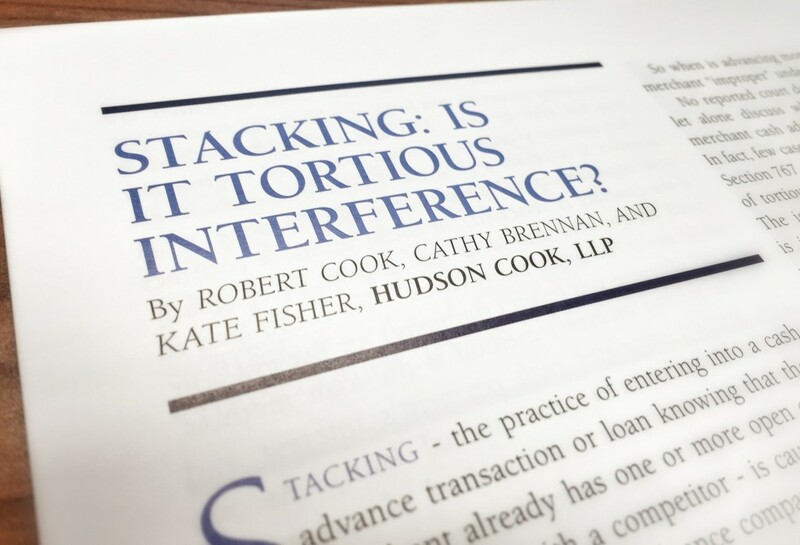 Home › Business Lending, merchant cash advance › Stacking: Is it Tortious Interference?